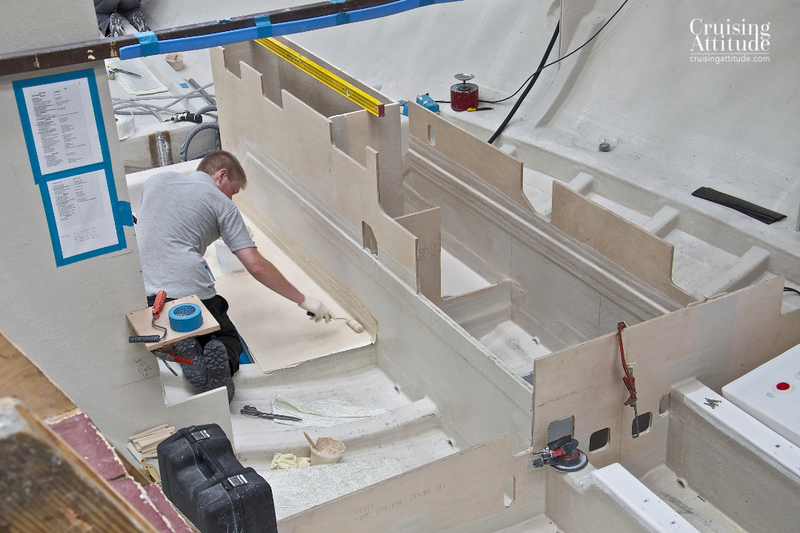 Discovery divides its build process into 3 stages (A, B, and C), depending on when each item needs to go into the boat. By May of 2014, we had made decisions on the “A” items and most of the “B”s as well. Here are some of the decisions we made and the reasons behind them. 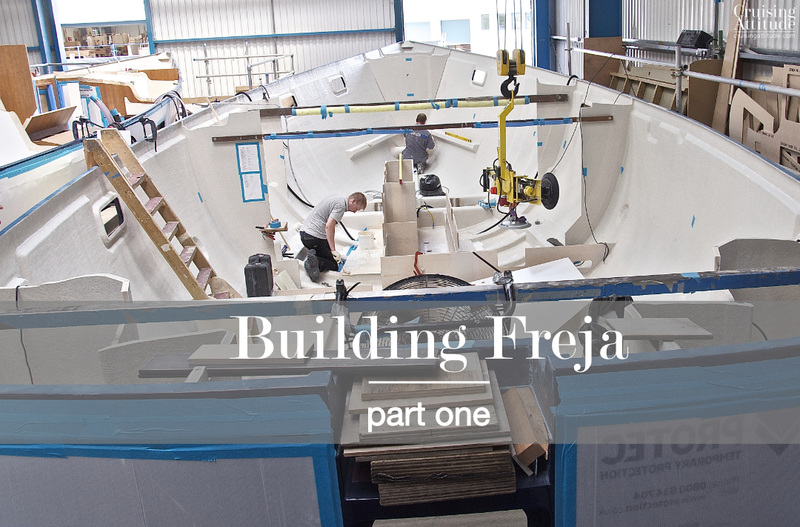 Beginning stages of building Freja’s interior. Sofa that converts to a berth for the starboard side of the saloon, instead of the pilot berth many people choose on their 55’s. One couple ordered a kind chest of drawers/cabinet there, for charts, drinks bottles and cocktail glasses. Another wanted 2 easy chairs like you sometimes see on the Najads and Hallberg-Rassys. We liked the sofa solution because it gives you somewhere to sit and take off your boots. It also gives more floor space for our dog to lie down. Finally, it makes a nice single berth with the lee cloth up. Additional hanging locker in the owners cabin instead of a seat. I don’t know why anyone would need a seat in the aft cabin, when you could just sit on the bed. This additional locker would give both Jacques and I our own hanging lockers for our “off-duty” wardrobe, and we would have equal storage space on both sides of the cabin. Upgraded windlass to Lewmar V5 and modified anchor chain stowage. Because we ordered the 55 kg Spade and 100 meters of chain we upgraded the windlass to handle the increased load. There is also a capstan next to the windlass. Upgraded to all-stainless Andersen winches. These winches are known for being the kindest to lines (less long-term chafe) and the easiest to maintain. They are also beautiful to look at! Integral boarding ladders on both sides of the boat. This is something we saw on the Discovery 57, which had recently been launched at the time of our visit. You can see them on the Discovery 57 in this video at 4.09. Stainless steel bow protector plate. We wanted this after seeing so many boats with their bows nicked and scraped. Additional mooring cleats. 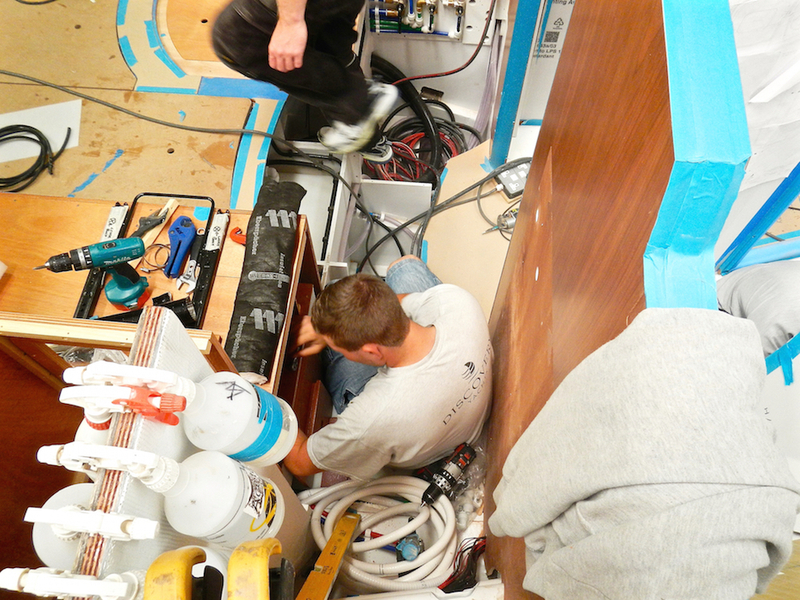 Keeping with the philosophy of “each line its proper cleat”, we requested two additional cleats at the bow and at the stern, giving us a total of 12 on the boat. Hot tub plumbing. Well, of course! We’ll be sailing in Scandinavia and northern Europe for the first few years. The bathtub is also a great place for rinsing and washing things like our diving suits and equipment. This is one of the unique features of the Discovery 55. 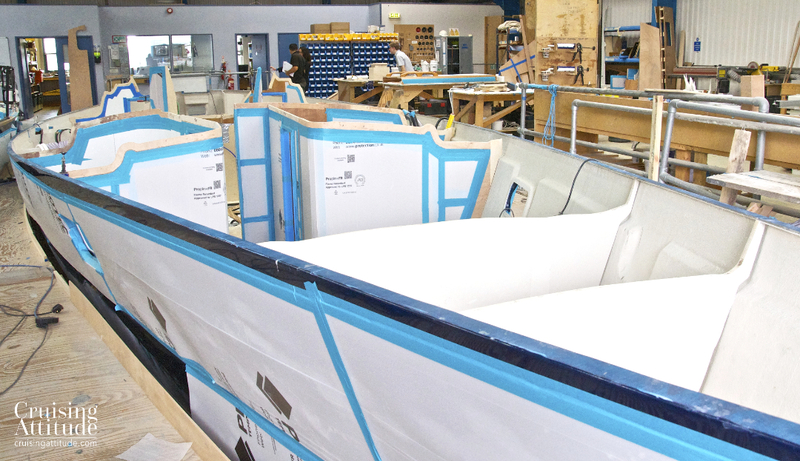 You can see the two waterproof bulkheads in the bow that will be fiberglassed in – the first contains the chain locker and the second, the sail locker. Grey water tank. My previous boat did not have one and I always felt embarrassed seeing our washing up water bubbles surrounding the boat. It’s better to keep your grey water in the boat until you get out of the anchorage or marina and into open waters. In part two, I’ll go over some more of our equipment decisions and show the continuing build process. 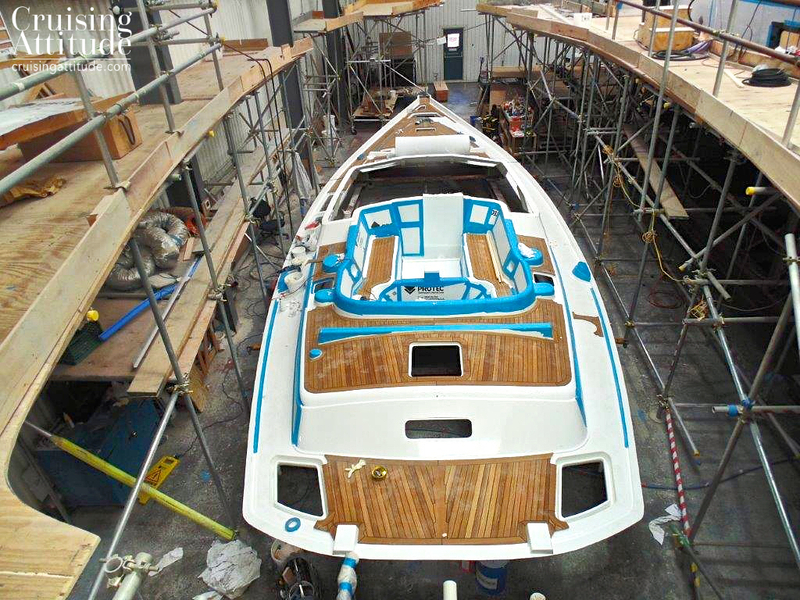 Getting started, part 6 – Is this our future boat? Is this our future boat? We arrived at the Discovery yard full of anticipation, like children visiting Disneyworld for the first time. I had a feeling in my heart that this was to be “the boat”. But we wanted to have that feeling in our brains as well as our hearts – that the emotional side would agree with the logical, analytical side. Sometimes, as you know, these two sides don’t always agree. We were greeted on Monday morning by Mark Williams, Discovery’s sales director, and were ushered into the conference room. After tea and shortbread (so English! 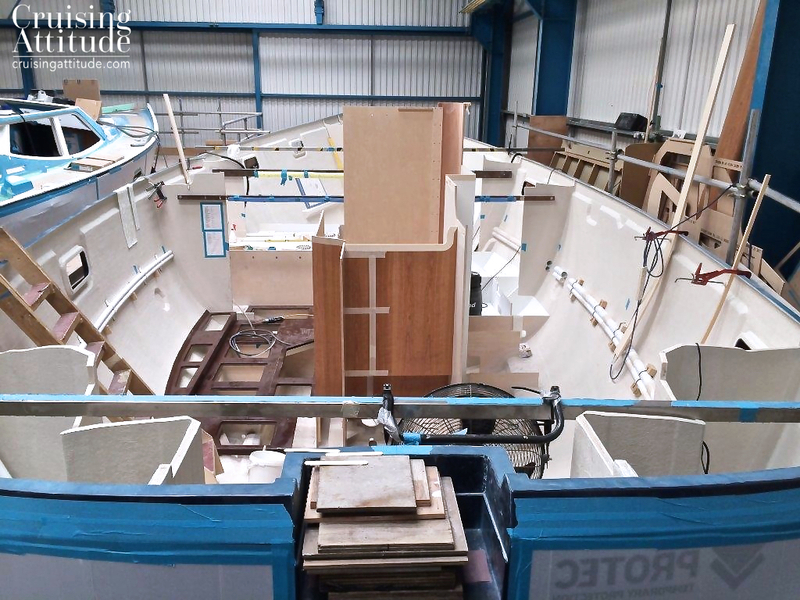 ), we were taken to see the yachts in build. There were two 57s and two 55s. 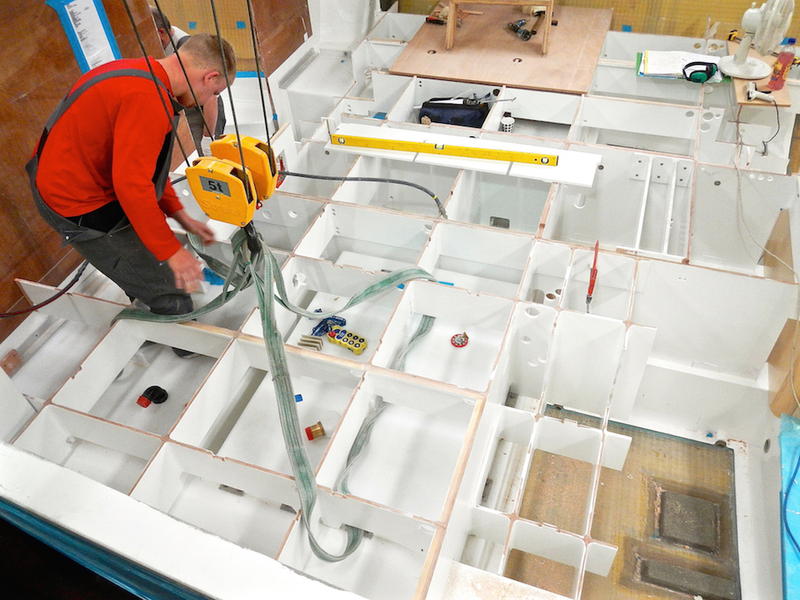 Seeing boats in their various stages of build enabled us to see the quality of materials used underneath the floors and behind the bulkheads and ceilings, something you don’t see in photos or at boat shows. Since Discoveries are constructed with the hull in an open state (the deck and cabin top are attached later in the build) we were really able to see everything. 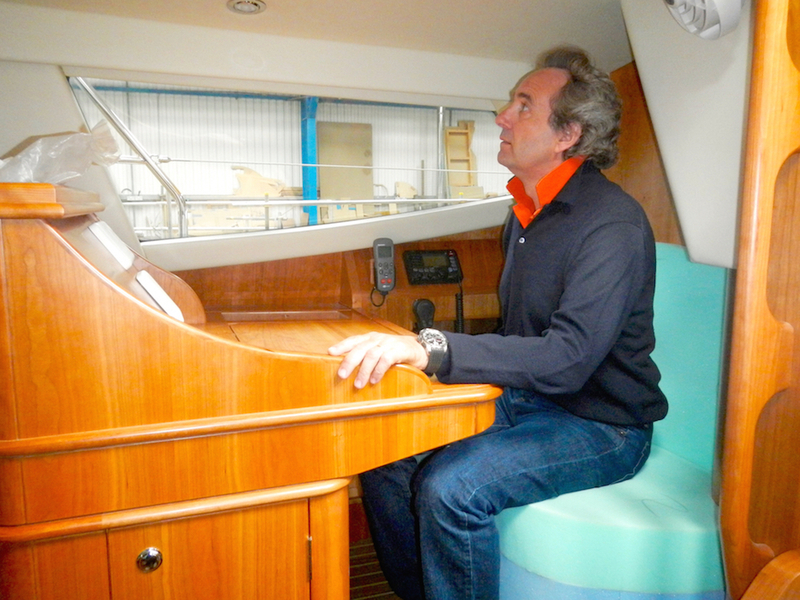 It was both fascinating and enlightening – something I’d never seen before, as my previous boats were bought as “previously owned”. 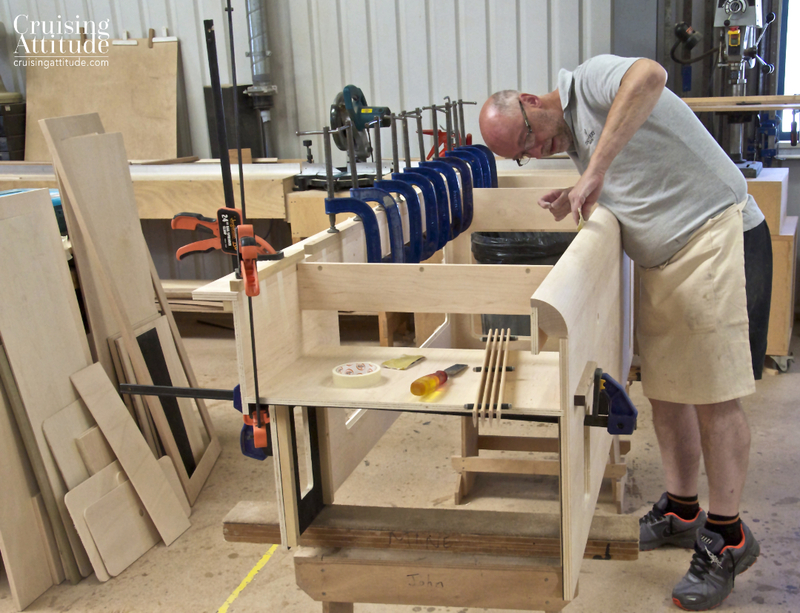 The woodworking area at Discovery. 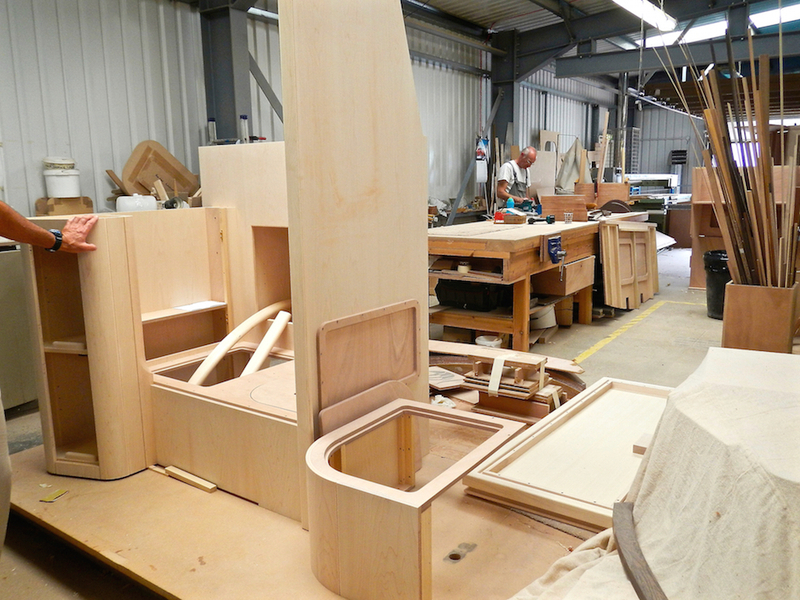 In the foreground, you see a few lockers, a settee and walls ready for the varnishing chamber. Finally, we stepped onto a 55. It was almost at the end of it’s build process. What an elegant and above all, solid-looking boat! Sitting the deep centre cockpit, I thought, “this is a boat that makes you feel safe.” It was then I noticed the hot tub that we saw in the Discovery video. Yes, folks, there is a hot tub in the cockpit. For anyone who sails in the colder parts of the world, this is a serious plus. For us, Discovery racked up some serious bonus points with the hot tub. We imagined ourselves being in an anchorage in Norway in early spring, snow-blended rain coming down and sitting in our warm hot tub, glögg (nordic hot-mulled wine) in hand. John and Caroline Charnley, the founders of Discovery and owners of hull number one, come up with this genius idea. It was simple. 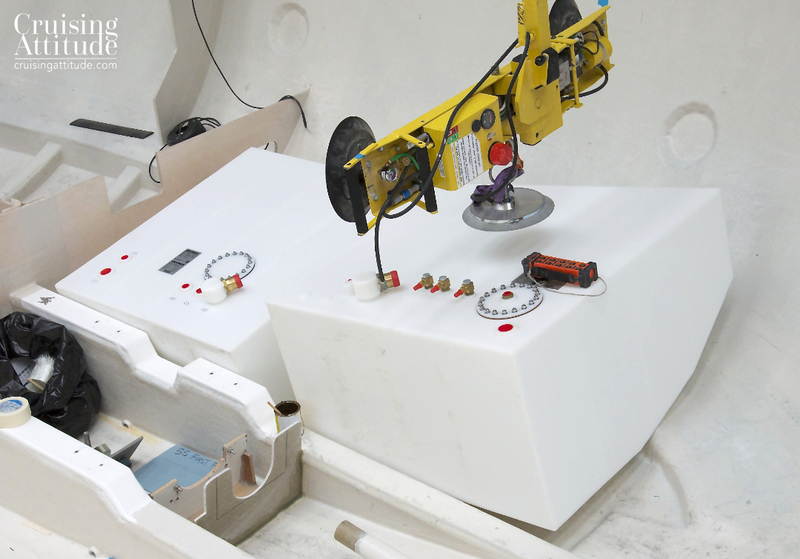 The helming position had been designed as a separate area from the rest of the cockpit, so it was just a matter of installing hot and cold water faucets to pour water into the area. 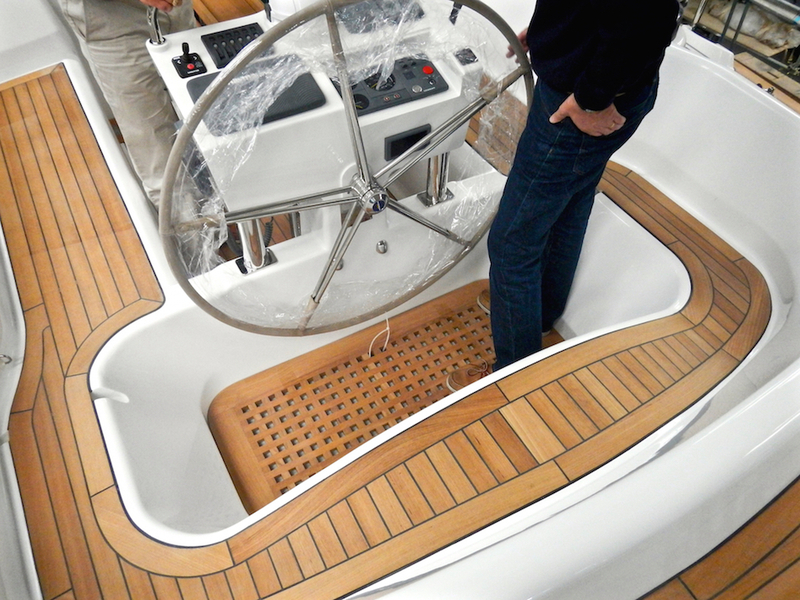 The companionway has only three wide and comfortable stairs to get into the saloon area. This was important as we have two large dogs. Too large to carry up and down the stairs. These stairs they could handle! The nav station was just amazing with it’s 270° view. The nav station to us was always “sea sickness central” as it’s normally located deep down in the darkest part of the boat, with no view of what’s going on outside. The dinette also provides a 270° view. I started to daydream about being anchored up in a lovely anchorage in Sweden, reading a book or having a meal or drinks, and observing the beauty outside. We noticed that the windows in front open up to let a breeze through. We were impressed with the galley. It had as many linear centimetres as our kitchen at home. 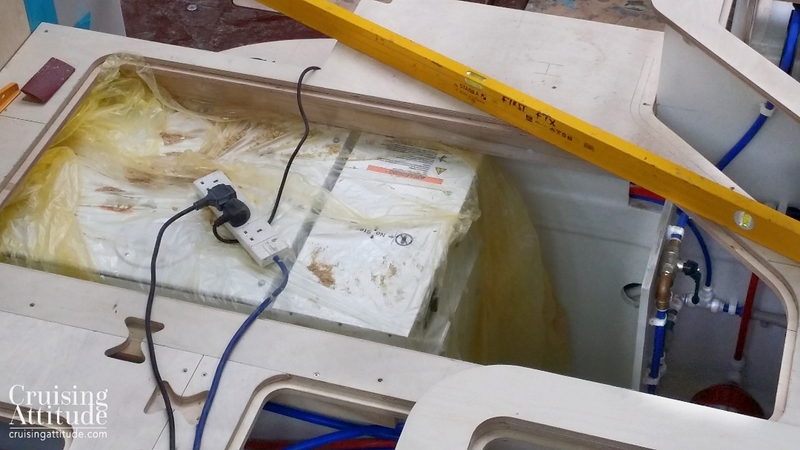 The fridge and freezer had more capacity than ours at home. It also had one of those famous GN Espace 4-burner ovens. We had read about them in Yachting Monthly’s test of marine cookers, in which GN Espace won “Best on Test”. To make a long story short, we were enchanted with the boat. Next, we sat down with all of our questions about the build process and materials used. And finally, we talked about an offer. This was really great news because we knew just how much all of these items (or similar items) on this list cost. With one or two exceptions, they were all on the options list for the 3 other boats for which we had offers. Full height pantry with sliding baskets instead of the wet locker (you always need lots of space for storing food). Settee (sofa) instead of the standard pilot berth on starboard side (provides more floor space for the dogs and a place to sit down to put on your boots). 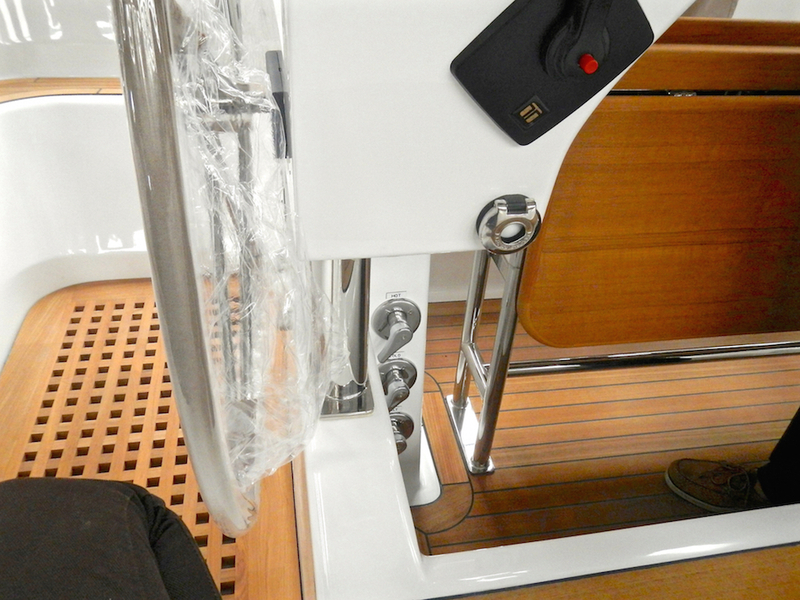 Retaining catches on floor hatches (safety feature in case of capsize — see this video from Yachting Monthly magazine about what happens when you roll over. Bimini with full enclosure (a tent for the cockpit, something you see often in the colder climates so you can enjoy your cockpit when it rains or when it’s cold). Hydraulic boom vang (makes the topping lift superfluous – which means we’d have a “crane” to lift things from the water, such as the inflatable kayak we’ve been eying). Grey water tank (to fit in with new rules on water pollution/ecology in the Baltic Sea). This was the basis for the offer we requested from Discovery. The last part of our day was a visit to Ocean Village Marina in downtown Southampton to see a 57 that was already in the water. We turned down an offer to test sail her. We thought that the 55 was so different from the 57, it wasn’t worth the extra day it would take. 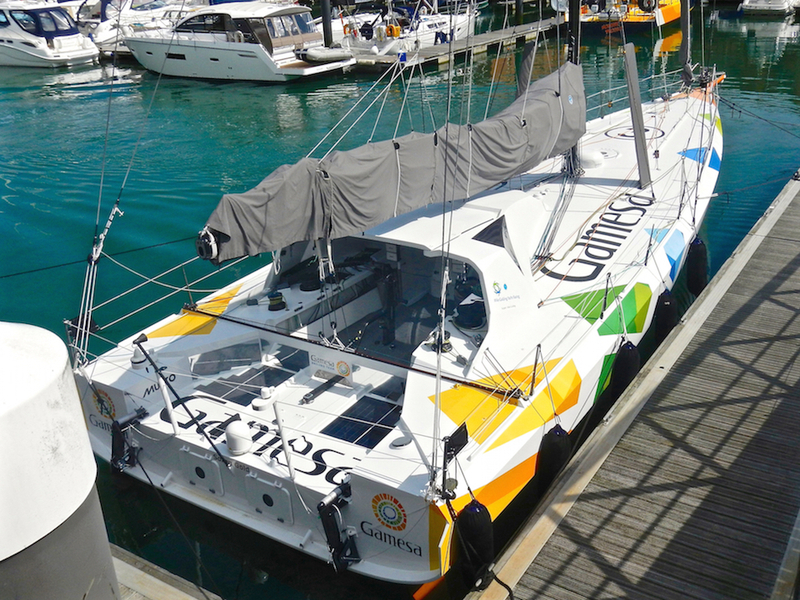 Mike Golding’s Open 60 “Gamesa” at Ocean Village Marina. He finished in 6th place in the Vendée Globe race (88 days, 6 hours). The huge, twin-helm centre cockpit of the Discovery 57 – it felt much too big for us. 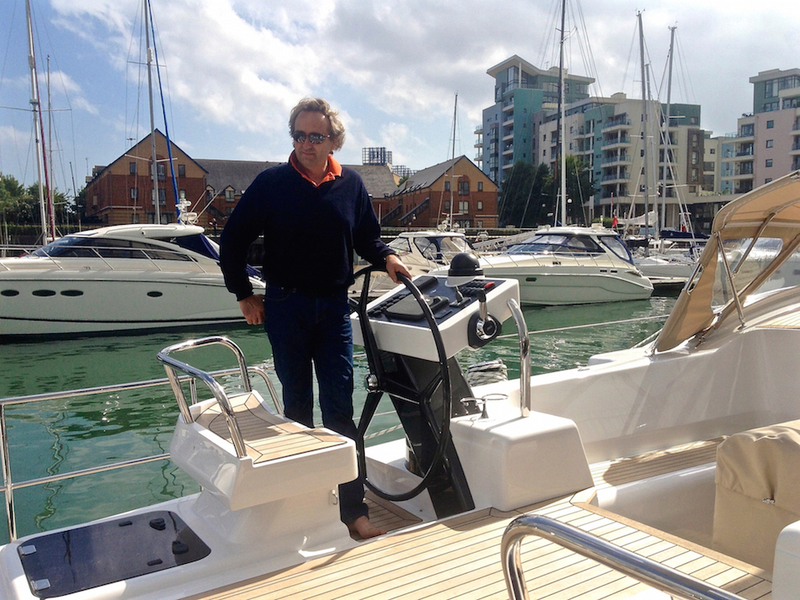 We had a chance to speak with John Charnley, the founder of Discovery Yachts. He was at Ocean Village getting his Discovery 50 catamaran ready for it’s next owner. We got an excellent impression of John. He seemed to be the quintessential British gentleman: soft-spoken, articulate and pleasant. We now had a short list of three boats to consider. It was July, 2013 and we would have to make a final decision by October or November. We also had our appointment to visit the Hallberg Rassy yard at the end of August coming up. 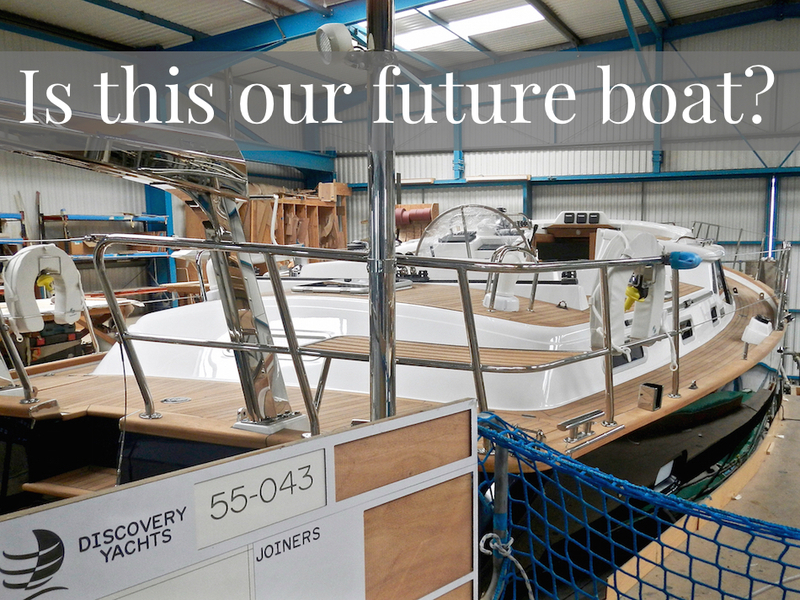 “Dreaming about our future boat” was about to become “planning our future boat”.